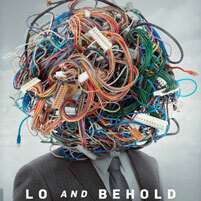 The latest trailer for Werner Herzog’s new documentary, “Lo and Behold: Reveries of the Connected World,” features an interview with Carnegie Mellon University’s Marcel Just in which he speculates on the potential to someday “tweet” thoughts. Just, the D.O. Hebb University Professor of Psychology, is one of several CMU scientists highlighted in the film, which will be screened as part of Pittsburgh Filmmakers’ “Science on Screen” series at 7:30 p.m., Friday, July 29, at the Regent Square Theater. Last summer, in Pittsburgh and in Silicon Valley, Herzog and his production crew filmed CMU projects including the Scientific Imaging and Brain Research Center and the CHIMP robot, and conducted on-camera interviews with various CMU faculty and staff members. The screening will include a Q&A with Just as well as talks with Lead Robotics Engineer J. Michael Vande Weghe and Professor Raj Rajukumar, the director of the Real-Time and Multimedia Systems Lab in the Department of Electrical and Computer Engineering. CMU’s self-driving Cadillac will also make an appearance. The film premiered at the Sundance Film Festival in Park City, Utah, in January and opens nationally Aug. 19. Doors open at 6:30 p.m. Tickets are $8.